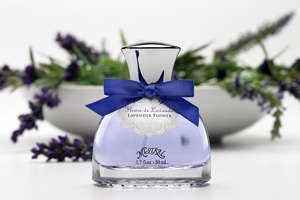 Lavender Flower Eau de Parfum is as alluring and evocative as the Provencal landscape in which it was born. This scent is a rich aromatic tapestry of fresh herbs, soft woods, green leaves and precious florals delicately woven to celebrate the immortal fragrance of the storied lavender plant. I love lavender so this sounds nice to me. Also, wholly wow that image is beautiful. Hypnotic! I can’t decide if I love the bottle or if the ribbon makes it too twee for me. I suppose that I could always remove the ribbon. Why am I such a sucker for purple juice? ha! I know—the purple calls to me….and I like the bow (twee and all) see now, if it was anything but lavender I’d be tracking some down already! I always think Iris scents should be purple….don’t know why. I say remove the ribbon. That bottle is just so cute! I love purple …..unfortunately Lavender is almost 100% a deal breaker for me. I’m always willing to sniff , but I’ve never found anything containing lavender that I’d wear. I like lavender, although I don’t usually wear it during the day. I like to sleep in it – although I’m sure that some nice lavender lotion would do the trick just as well as my beloved Jicky. Betcha this one is cleaner than most. Such nice, low-key, understated ad copy. Don’t they know they’ll never win Le Prix Eau Faux that way! Lavender has been problematic for me in the past, but I have tried a couple of things with lavender lately that worked for me – just can’t remember what they were at the moment. I’ll give this one a try at some point, I’m sure. It’s too understated for me: would like to know the notes, and maybe some more about how it smells: is it clean? Sharp? Citrusy? don’t you want to know how it’s going to transform your entire consciousness, renew your inner woman, infuse you with supreme confidence and create world peace? Rustic & Cynthia – have you tried By Killian “A Taste of Heaven”? It’s current favorite lavender. Check it out! Oooh… I might have a sample of that that I haven’t tried yet. Thanks for the suggestion! I haven’t tried any BK yet. fortunately for me (and my poor beleaguered piggy bank) none of the by Kilians have really seemed anything special to me. One was alright—Cruel Intentions? ; the irisy one— other from that my reactions have ranged from “meh” to “ew”. I guess that leaves more for you and Cynthia! ha – the only one that I’ve liked so far is Back to Black. And I don’t know why I don’t have a sample of A Taste of Heaven – I thought that I had all of them except for the ouds. Maybe I gave it away. Hmmmm… one more thing to add to the list of things to sniff when I hit Saks. Oh! you know what I just tried? the Oud Rose —-no, I didn’t go buy a sample because I’ve never liked by Kilians and I don’t generally like Oud —but this is really really good! awesome….just what I need : a lemming for another spendy perfume! Not only that – but isn’t it even more expensive than the regular Kilians? Does it even come in refills? Cynthia, definitely try it! I’ve been wearing it all day and the lasting power is terrific too (which makes me feel better about the price, actually). I’m nursing a sample, but A Taste of Heaven is definitely on my “to buy” list. I’ll definitely ask for a sample when I’m at Saks. You know, when I fell in love with Back 2 Black, I still couldn’t make myself pay full price for a bottle. I bought the travel refills from Saks – at $70 for 30ml, it isn’t cheap, but it’s better than the alternative. I have a weaknes for both lavender and twee bottles, so this just hit my already-too-full must-try list. Sigh. ah, but where on the list? near the top? near the bottom? My problem with “to-try” lists is that everything is vying for the #1 spot! Ooops, same problem with the “to-buy” list….. I was saved by a faulty website – I almost ordered this unsniffed and then the coupon code that they sent me for signing up for their newsletter wouldn’t work, so I canceled the whole transaction in a snit. Looks good- anyone try their gardenia ? Lavender is hit or miss for me, but I do like their description of this! I have a sample of Mistral’s Blackberry, and while it’s quite sweet, it’s very nice. Their soaps are wonderful too. I’ve heard the soaps are lovely. Haven’t tried any yet. I’ve just recently learned that I do like lavender. I now have bottles of Caron Pour Un Homme and Patou Ma Liberte. Love ’em! This one sounds lovely! I like Mistral’s soaps, but have yet to try their bottled fragrances. I like it sometimes…that Caron is lovely! So is Jicky. Sounds good to me, love lavender. What a serene looking bottle, wonder if it’s as lovely in person as it is in the photo. I’d keep the ribbon, just because it’s coloring adds to the overall visual charm of the bottle. Sadly, this is where we part ways, because lavender and I are not fans of one another.